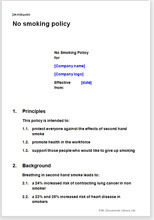 A comprehensive Non-Smoking Policy designed to integrate lasting effects in the workplace. Aids in compliance with health and safety legislation as well as promoting a healthier work environment. A comprehensive No-Smoking Policy designed to integrate lasting effects in the workplace. Aids in compliance with health and safety legislation as well as promoting a healthier work environment. Employees should be encouraged to give up smoking and should be given guidance and counselling wherever possible.